MainAll NewsDefense/SecurityWhy are there no security checks at Western Wall on Shabbat? Why are there no security checks at Western Wall on Shabbat? Channel 2 investigation reveals people posing as haredim could bring weapons, explosive devices into Western Wall on Shabbat. A special Channel 2 investigation revealed that from the beginning of Shabbat until its end, as well as on festivals, religiously garbed Jews do no undergo security checks at the Western Wall. In their report Monday they added that those who come to visit the wall do not go through a metal detector and are also not bodychecked by a security guard. 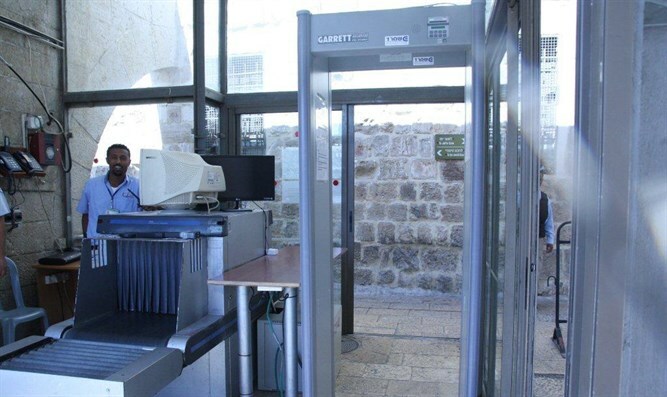 This omission could allow people to dress as religious Jews and conceal knives and explosive devices on their persons when entering the holy site. The Tzomet organization for automated Shabbat devices has developed special detector gates which could be used on Shabbat. These gates were installed once at the entrance to the Western Wall compound and at the entrance to the Shaarei Tzedek hospital in Jerusalem. The gates work with a compass instead of a sound device and even when they do not detect any metal items, electricity passes through them. In this way a person passing through these gates with a metal item would only change the level of the charge passing through the gate but would not activate or extinguish any electrical device. A special sign informs all those passing through the gate that they do not need to be concerned about passing through the gates on Shabbat.